Stolen jewels. Speeding motorboats. A trail of blood . . . The case of the missing Swedish treasure reads like a crime novel. But in an odd twist this week, Swedish officials announced that the stolen objects may have literally been trashed. The stolen artifacts were funeral regalia: items placed inside or on top of a coffin to symbolize a deceased royal’s identity and rank. The items, worth $7.2 million, were on display at an exhibition in the cathedral. The thieves quickly escaped via speedboat or jet ski. Police hunted for the robbers on land and sea. They arrested two men in September, but the jewels were not with them. Swedish police successfully tracked down one suspect from blood left at the crime scene. 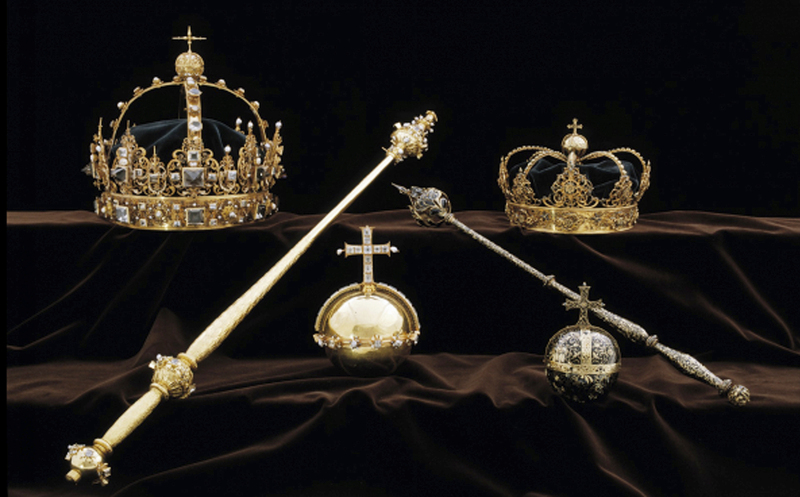 Now police say that “all seems to indicate King Karl IX’s stolen funeral regalia have been found in the Stockholm area.” Some of the jewels date from 1611 (the date that King James’ version of the Bible was published). The stolen objects—or at least good copies of them—were found in a suburban trash can. More details will come “when [police] know for sure” whether the recovered objects are real or fakes. The trial for one 22-year-old Swedish man accused of stealing the treasures from the Strangnas Cathedral began last week. He has not yet been publicly identified. A second man has been detained but not charged. The trial is on hold while the investigation continues. Like most crimes, this one looks to have a very “be-sure-your-sin-will-find-you-out” (Numbers 32:23) ending. Wow that is interesting! I wonder if they are real or fake? isn't the funeral regalia kinda sound gross? I mean first you die then they burn you then you get pt in a ball but im glad that they were found! This story does sound like something you would read in a mystery novel! I hope they found the real jewels. I agree with you Leah P it is pretty gross. and I thing that whenever someone is elected king they have to hold the jewels. I mean, I wouldn't want to wear a crown that was once owned by several dead guys.